Alright parents, how many of you remember that time you spent a bunch of money on a new sports uniform, just to have it all stained after the first practice or game? Yeah…me too. But kids will be kids and you don’t want them to stay inside all day, do you? Me either! Instead of worrying, why not check out ESPRO Sports Cleaner? ESPRO SPORTS CLEANER not only is ideal to use on athletic uniforms and sports gear but it is truly a great multi-purpose stain remover. Our customers have discovered it is the only stain remover they need around the house, and they use ESPRO for food stains, pet stains, carpet stains, furniture, car upholstery, hunting stains, blood, even tile floors. We are proud to claim that over 100 college and pro equipment managers, including several MLB teams, now consider ESPRO their primary pre-spot stain remover, and both major and independent sporting goods stores and big-box retailers have stocked ESPRO. The first t-ball game my son played, I think he was trying to play like the guys on TV and was in the clay more than on his feet! He brought home a ton of that lovely, red chalky dirt from the field and various grass stains and something that looked like chocolate ice cream. I can’t afford to simply buy a new uniform every time he seemingly ruins this one, so it was time to get to work and get the stains out. ESPRO Sports Cleaner was designed for these moments exactly. It was developed to help keep sport uniforms and equipment looking their best without having to replace items before they were worn out. It wasn’t long before the same product was being used on carpets, rugs, couches and even in the car. I personally keep the handy spray bottle with my laundry products. Whether I’m getting the clay out of the baseball uniform, grease off my apron or who knows what off my husband’s nursing scrubs, every stain gets a quick squirt and brush before I toss it in the washing machine. I keep the large refill bottle in the closet, which is great knowing I won’t run out any time soon. Plus they have these neat portable wipes that I can keep in my purse or the car for getting out spots when we’re away from home. I have some great news for my readers! 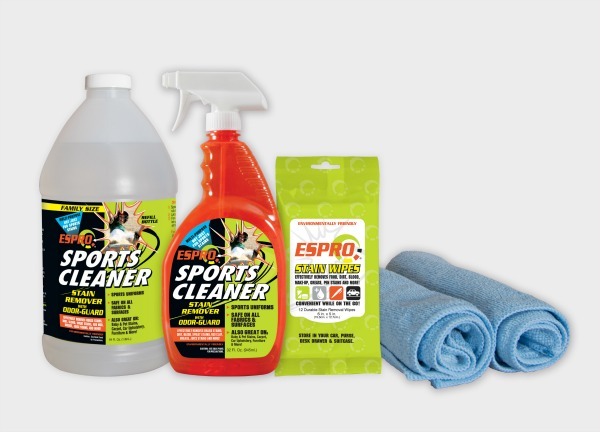 I get to give away the ESPRO Sports Cleaner Deluxe Package Special! See the details below and good luck! 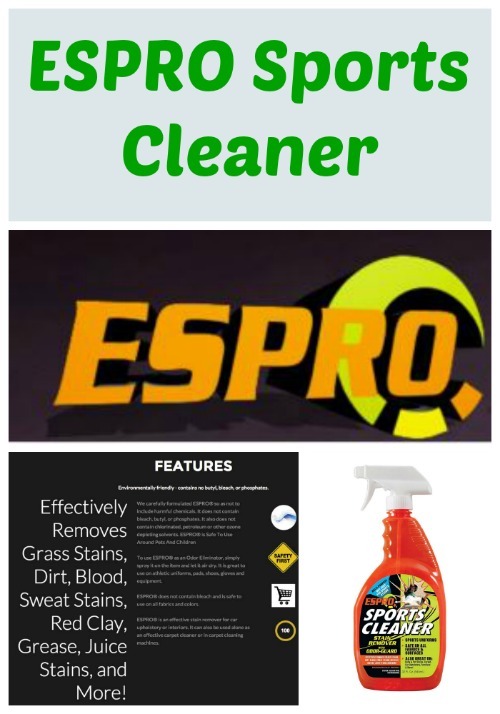 Learn more about ESPRO Sports Cleaner through their website, and connect with them on Facebook and Twitter for the latest news and specials. Grass stains from my daughters soccer uniform in the fall and her softball uniform in the spring!